Free Zone Aruba is very proud to welcome Curacao Oil NV (Curoil) to the Aruban free zone. Curoil (Aruba) Freezone NV is the first company that offers bunkering services to national and international vessels in Aruba. Their services are available in the Oranjestad and Barcadera harbor. Besides supplying fuel to Curacao and Bonaire they expanded they operations to Aruba. Curoil will be active on- and offshore. They are supplying a full range of fuels and lubricants from its 6,854dwt double-hulled tanker Zeta 1. Bunkering in Aruba will provide customers with end-to-end bunker and lubricant supply and related services. Curoil Aruba will supply high quality bunker fuels; IFO 380,180 and MGO (high and low sulphur). Since 1985 Curoil supplies fuel on the islands of Curacao and Bonaire to airports, utility companies, gas stations and vessels in the harbors and also offshore. Their main oil and gas supplier is the Curaçao refinery Isla NV with capacity of 320,000 barrels a day. Curoil operates under international standards of Shell Airport Operations Procedures and under international ISO-Certified standards. 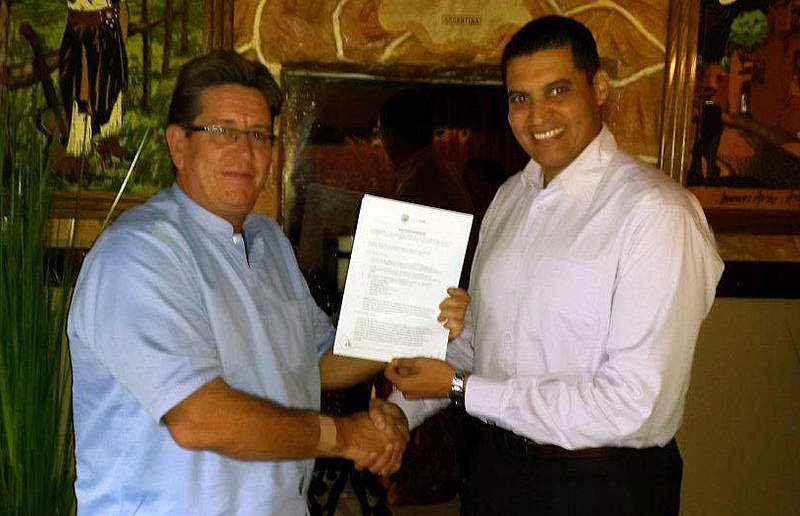 Curoil (Aruba) Freezone NV received the operations license the operate in the Aruba free zone on December 16,2013. Free Zone Aruba (FZA) NV’s Managing Director Mr. Greg Peterson commented:” We are very happy to welcome this new free zone company that will have added value to the further development of Aruba as the Green Gateway”. Photograph: Mr. Yamil Lasten, Managing Director of Curoil and Mr. Greg Peterson, Managing Director of Free Zone Aruba (FZA) NV.